This Luni-solar calendar [LSC] is based on each month, or lunation, beginning at dawn following the moon's conjunction with the sun. The first day of each month is called New Moon Day and is observed by abstaining from common labor and in worshipful consecration of oneself to Yahuwah, the Creator. Each month consists of either 29 or 30 days. In the 30 day months, the last Sabbath is followed by translation day, then New Moon Day, both of which are not counted as part of any week. Four complete weeks of seven days follows: six days of work, then the Sabbath which always occurs on the 8th, 15th, 22nd, and 29th of the LSC months. These LSC dates can fall on any day/date of the Gregorian calendar which, unlike the Creator's calendar, uses a continuous weekly cycle. If the LSC New Moon day falls on a Mo-day, the following four Sabbaths will also fall on Mo-days. From month to month (lunation to lunation), the New Moon Days and Sabbath Days will fall on different Gregorian days/dates and, consequently, will appear to 'float' through the Gregorian calendar. The New Year is reckoned by the New Moon closest to the spring (vernal) equinox. In order to keep the lunar year aligned with the solar year, a 13th month must sometimes be added. There are seven thirteen-lunation years in every nineteen year cycle; this is called the Metonic Cycle. This makes the calendar truly luni-solar. These adjustments are somewhat similar to the extra day in the leap year of the Gregorian calendar. To use: Once New Moon Day has been determined, simply fill in the planetary days of the week, (Sunday, Monday, Tuesday, etc.) 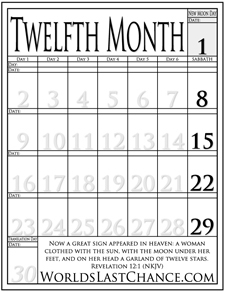 at the top of that month, and the corresponding dates of the Gregorian calendar for the remaining 29 or 30 days. This calendar is perpetual as all months and years will be the same, only the days and dates of the written-in Gregorian will vary. Fear the Eloah of Creation and worship Him on the days He has sanctified. Let us all preach the Sabbath more fully. 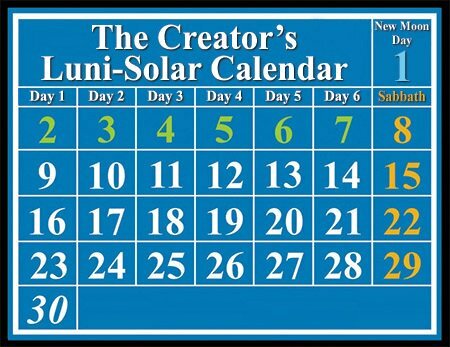 Please check out the WLC Luni-Solar Calendar Application! This Application is FREE to download to your computer and can be individually customized to your specific location!